Powerful 24-pin print head technology delivers high-quality text and graphics for critical applications. Offers an MTBF rating of 20,000 Power On Hours to facilitate greater productivity with less downtime. Long-life ribbon cartridge reduces the need for frequent ribbon changes and ensures the lowest cost per page. Provides four convenient paper paths to accommodate cut sheet paper and continuous forms up to 5 parts thick for greater flexibility. Provides parallel and USB interfaces, plus a slot for optional interface cards, including high-speed Ethernet, for greater compatibility with practically any system. Improved menu navigation allows quick and easy changes to printer settings. 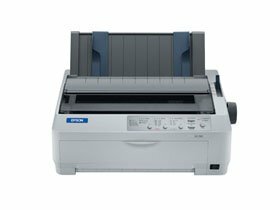 Maximum Print Speed (Black): 529 cps; Network Ready: Yes; Printer Type: Dot Matrix; Monthly Duty Cycle (Pages): 20,000.